We’ve had such beautiful weather here in South Texas, I’ve got spring fever. 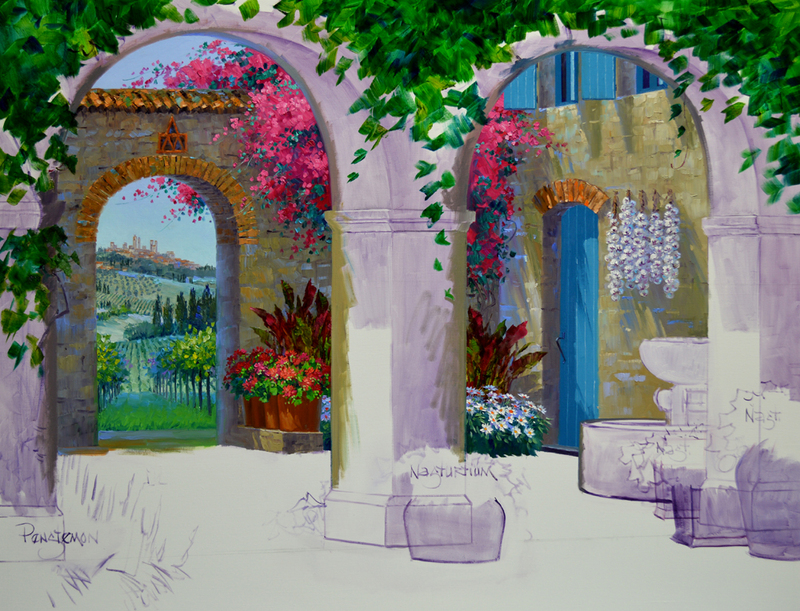 So instead of painting today let’s get out in the garden! 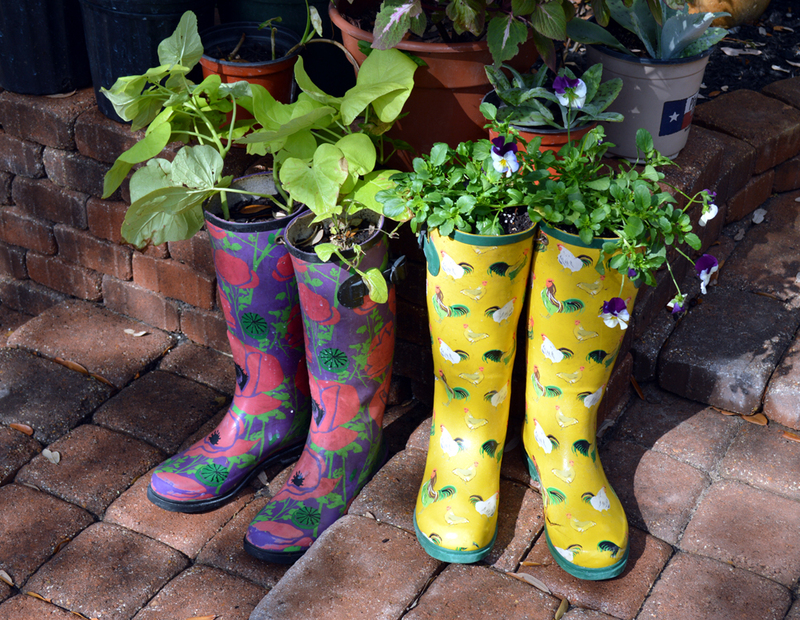 Remember my recycled Garden Boots? Well, the plants are getting a little larger and looking good. To see how we made these into planters CLICK HERE. 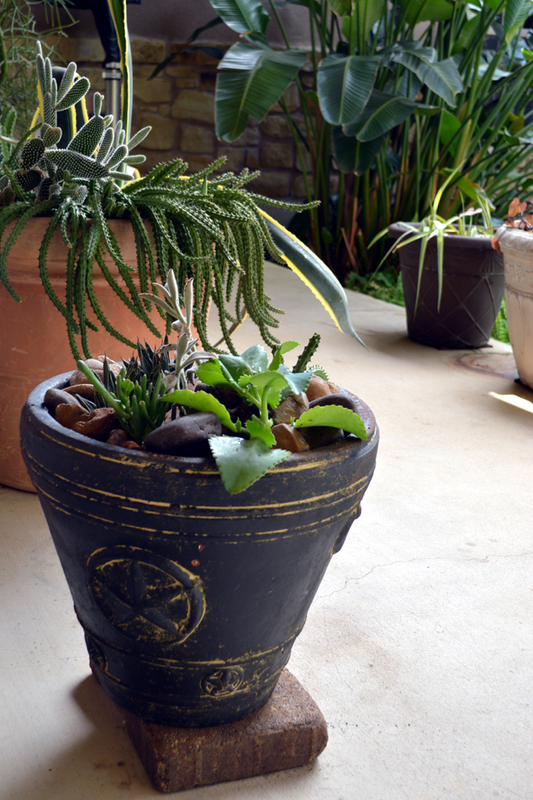 When Paul O’Brien, our friend and collector, visited a couple of weeks ago he took us to Home Depot and surprised us with some beautiful containers for our back patio. Sissie, one of our shelter kitties, had to make certain they were OK before we could do any planting. 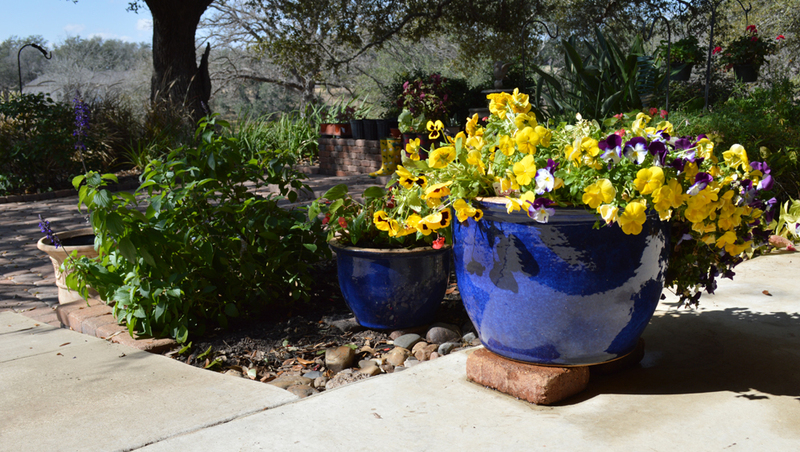 Yellow Pansies are perfect for the larger blue ceramic pot. We decided to repot a Begonia into the smaller container. I had to cut it back some in the transfer but it will fill out and be flowering in no time. The Mystic Spires Salvia to the left of the pots is just starting to bloom. Just click on the picture to see it larger. 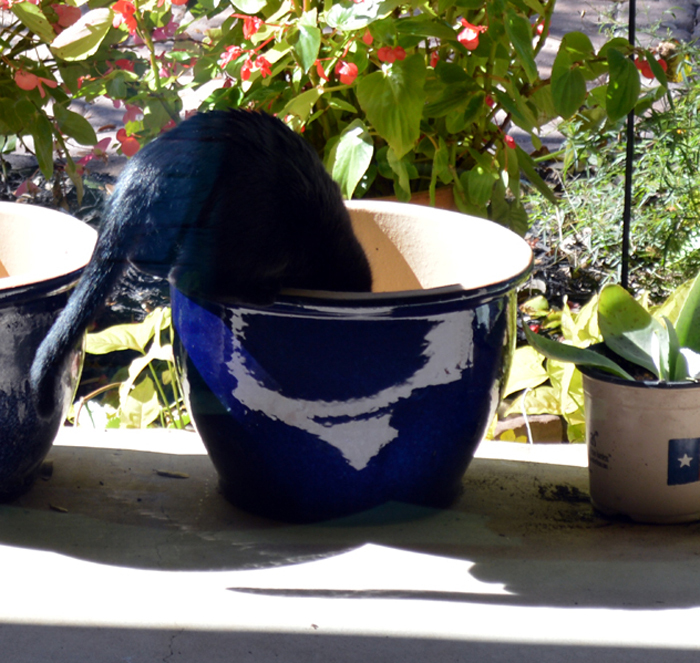 Paul chose a Texas Pot for Jack’s succulent garden. We planted several different little babies. Give them a few months and they’ll totally fill the container. As soon as we are safely past any freezes we’ll move the succulent containers back to Jack’s garden on the other side of the studio. 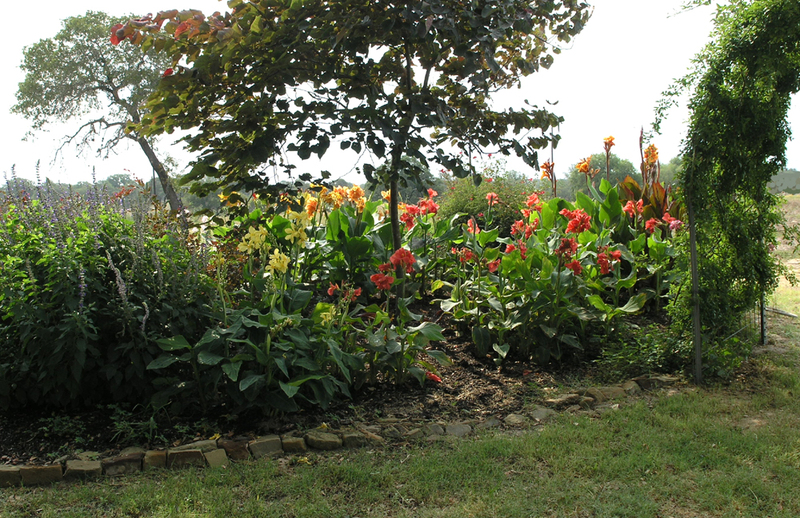 Canna Lilies are some of my favorites, with wonderful blossoms from late spring until the first frost. We have a huge bed in our garden devoted to these delightful flowers. They add a burst of color nestled between the Salvia and the Peggy Martin Roses on the arbor. 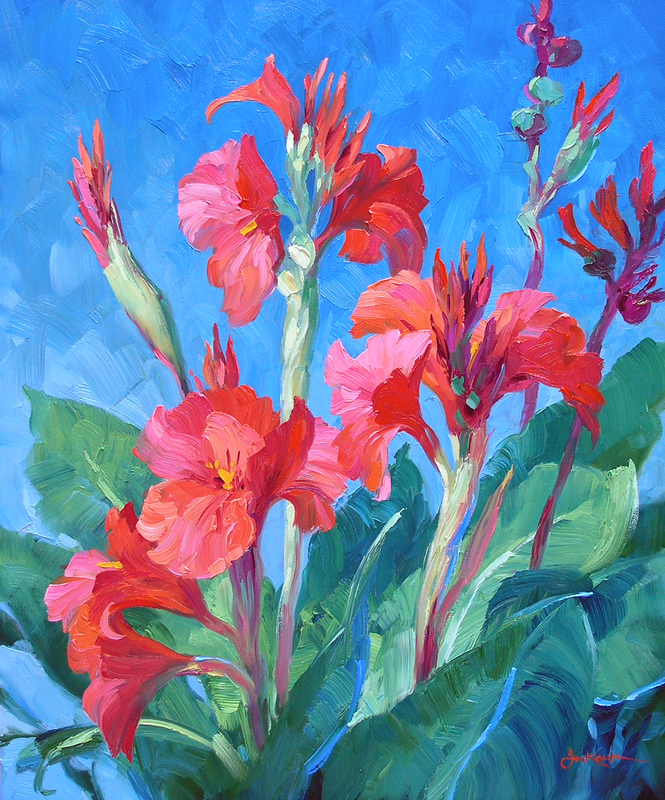 So it was a treat to capture our Captivating Canna Lilies on canvas. February 14 is just around the corner, what about giving a Senkarik Original Oil Painting to your Valentine? 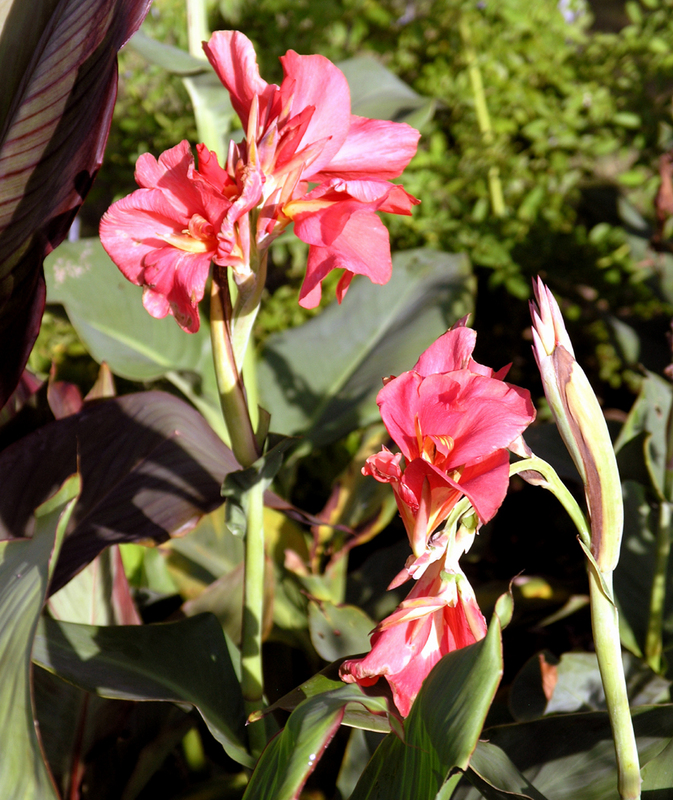 Captivating Canna Lilies will make a wonderful Valentine’s Gift. A bouquet that will remain fresh long after a regular one has faded away. 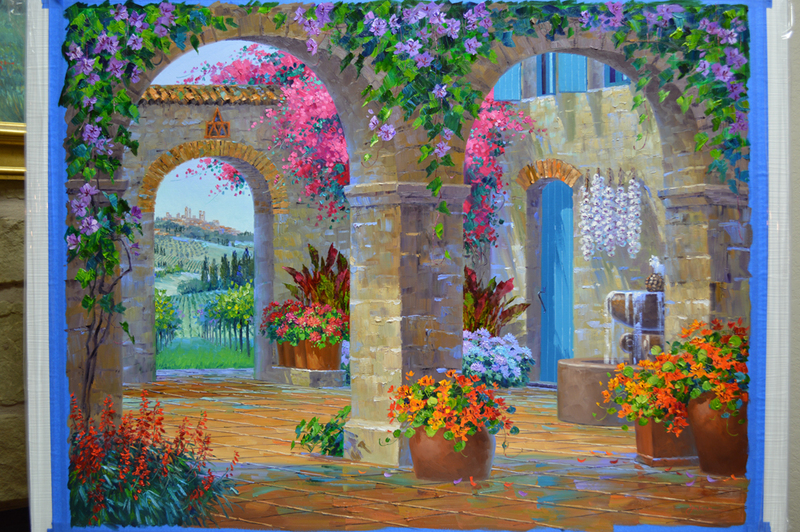 The retail price for this painting is $1,800. But we are offering it on my eBay auction just for you and better yet, the bidding begins at only a PENNY! 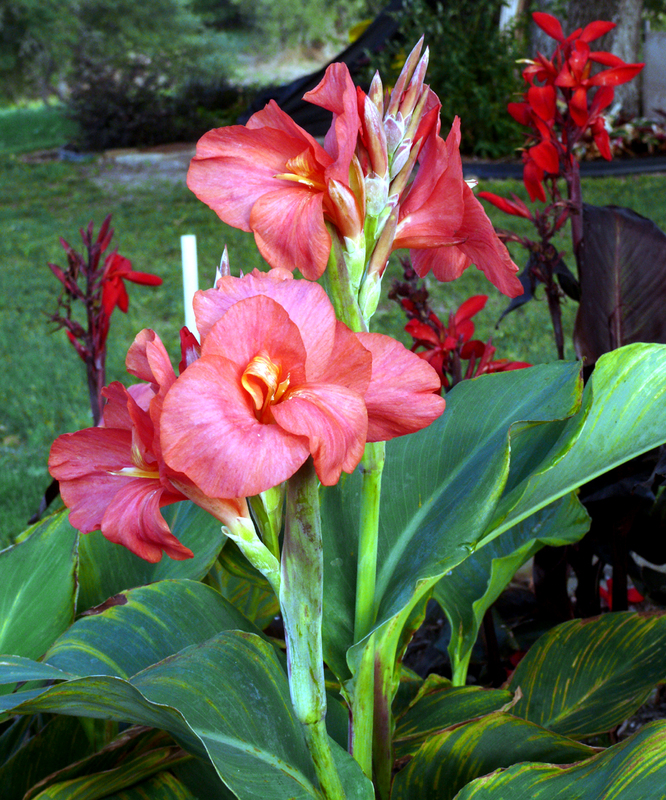 CLICK HERE to go to the auction for Captivating Canna Lilies. 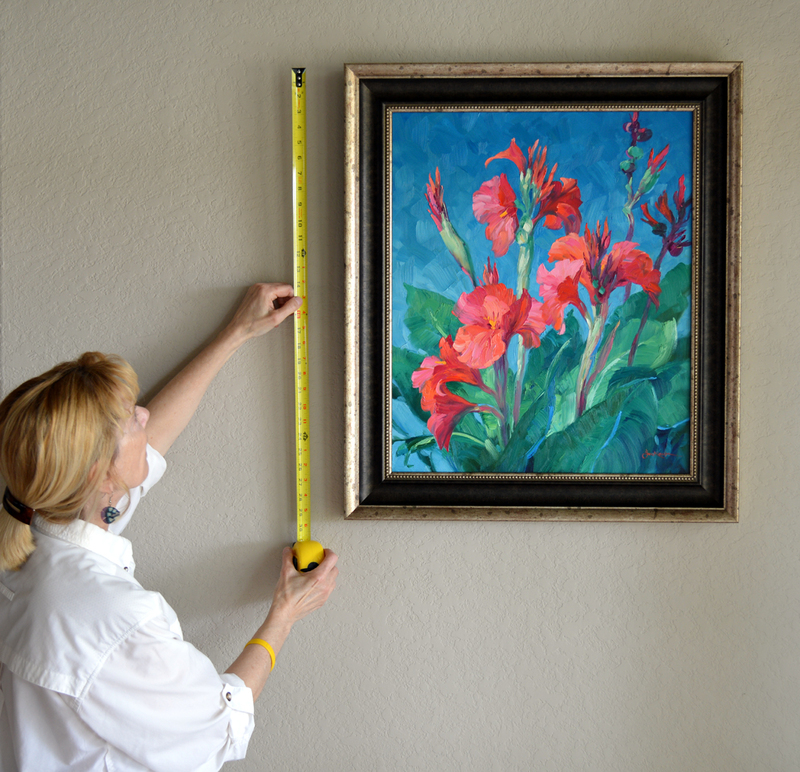 Captivating Canna Lilies is 24 inches tall by 20 inches wide, painted on a regular canvas and framed in a traditional wood frame. The outside dimension of the frame is 29 3/4 inches tall by 25 1/2 inches wide. It’s ready to hang on that special someone’s wall, we even include the hanger and nail. I don’t do many pieces like this one, Captivating Canna Lilies is a unique offering especially for our Team Senkarik Members. The auction ends Tuesday, February 5 at 8 PM Central Time. If you would like the painting personalized please let me know as soon as you win. We have to get this painting on FEDEX Ground so it will get to you in time for Valentine’s Day. 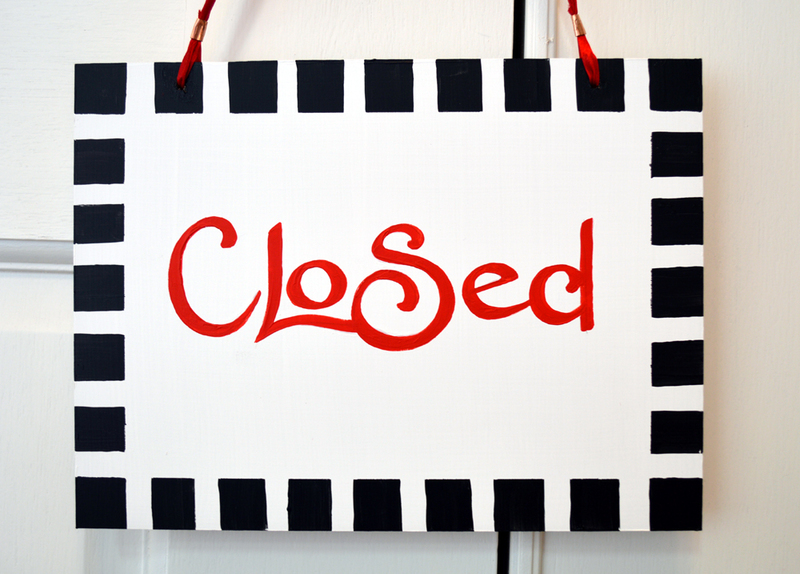 We’re moved! 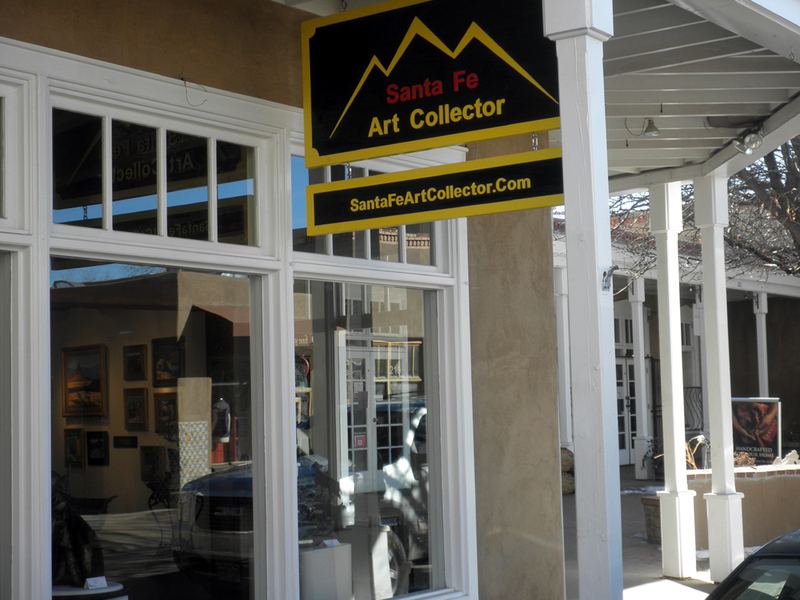 Santa Fe Art Collector is now at 217 Galisteo Street in a fabulous new space. 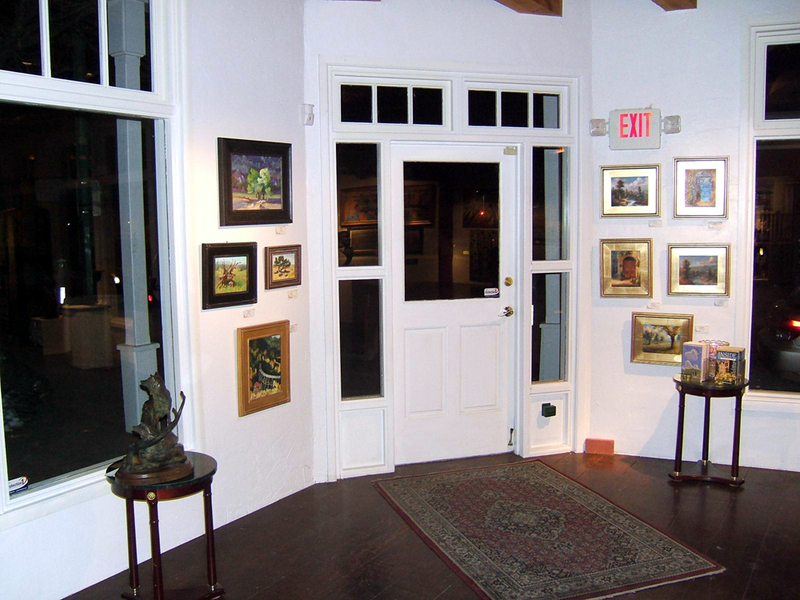 Come on and walk through the gallery with me. WELCOME to the gallery! This is directly inside the front door. Aren’t all the windows cool! Great for people to window shop from the street. I used to be in the space right next door to this one at Marcus Gallery. They’ve since closed but Nancy and Marcus used to complain they had to wash their windows every morning. Late at night people would press against the glass to see the art, then come back the next morning to make a purchase. Let’s hope Darrell and Phyllis are kept busy wiping nose prints off the glass and writing up the corresponding sales! Ta Da! The Senkarik Wall. It’s looking a little sparse, don’t you think? I’d better get busy painting! Remember, you can click on any of the pictures to see the image larger. The large flowers on the right are done by a wonderful gardening artist, Cami Thompson. She grows the most delightful Dahlias and uses them for her models. Eva and Americo Makk are on the left. 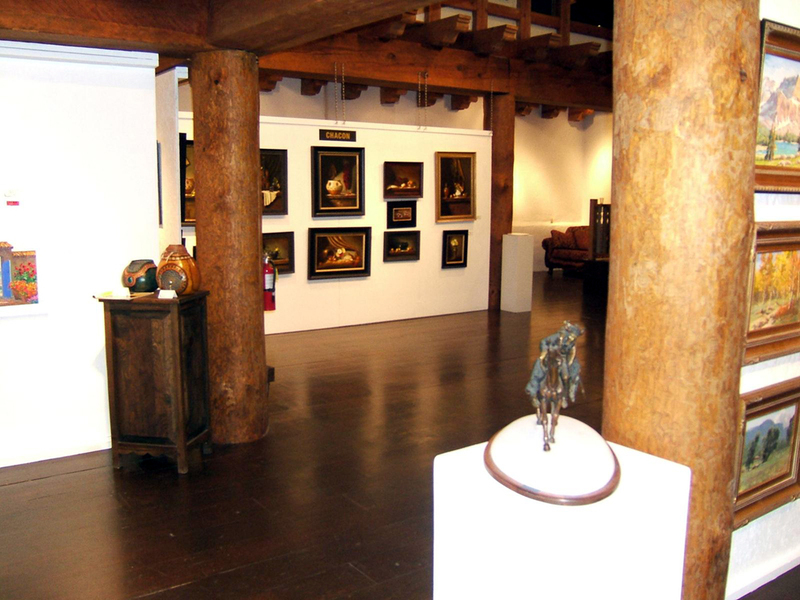 Don’t you love the Santa Fe style beams above? Anna Carll and Pentjuh, a Russian painter fill this cozy corner. Timkov, another artist from Russia, shares this wall with a few more Makks and Cami’s flowers. 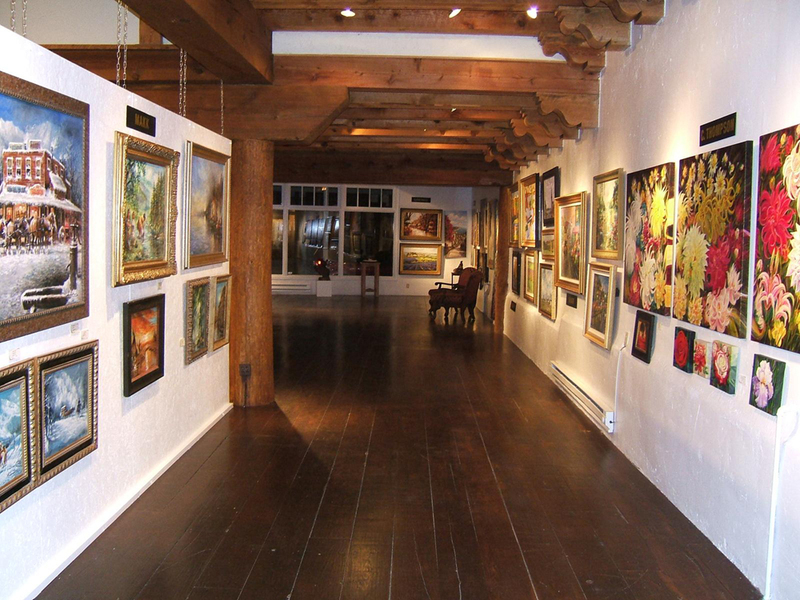 Isn’t the gallery so inviting and spacious? Those are Ed Chacon’s paintings on the far wall. This is at the back of the gallery looking toward the street. 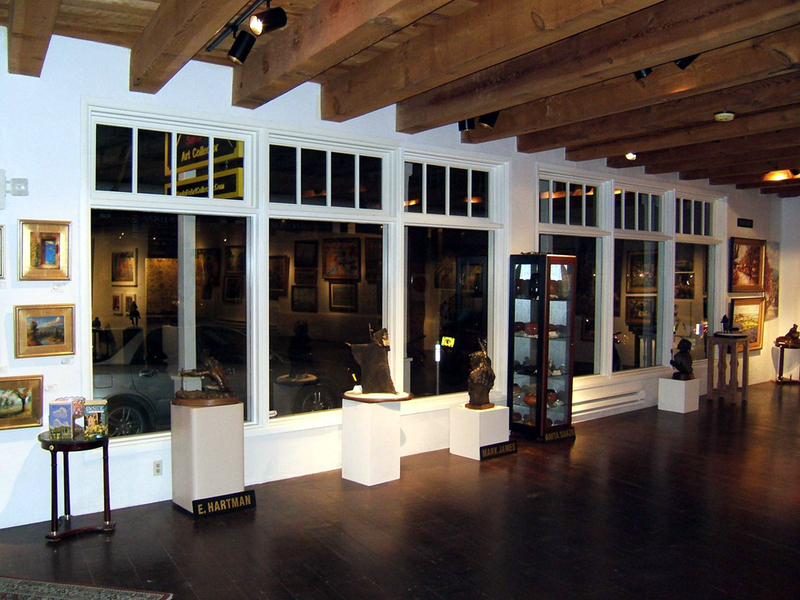 The area in front of the railing has a raised ceiling with skylights, the gallery is filled with natural light during the day. 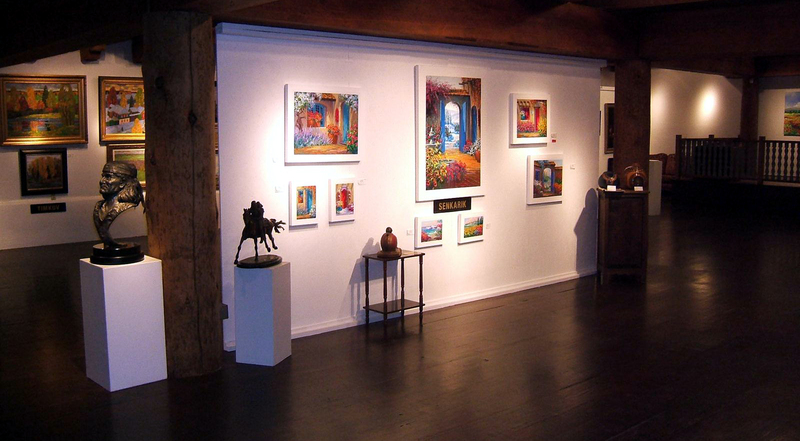 This gives you another view of Ed Chacon’s paintings along with Jo Sherwood’s work. I know it’s hard to tell but we are so excited about the new space. 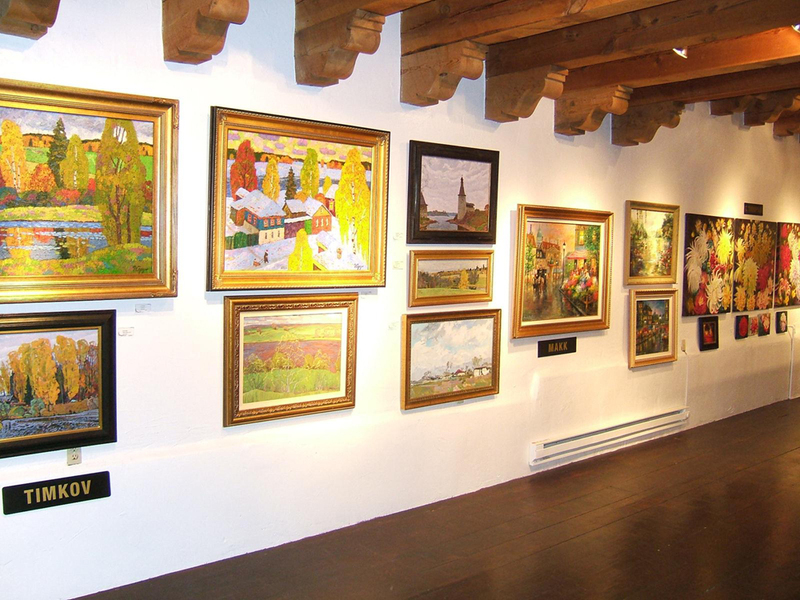 Everyone at the gallery has done a wonderful job hanging the art and making it all beautiful. It was a TON of work but it looks incredible. The shadows on the terra-cotta tile floor are painted with mixes of various proportions of MUD (Ultramarine Blue + Alizarin Crimson) + Cadmium Orange. 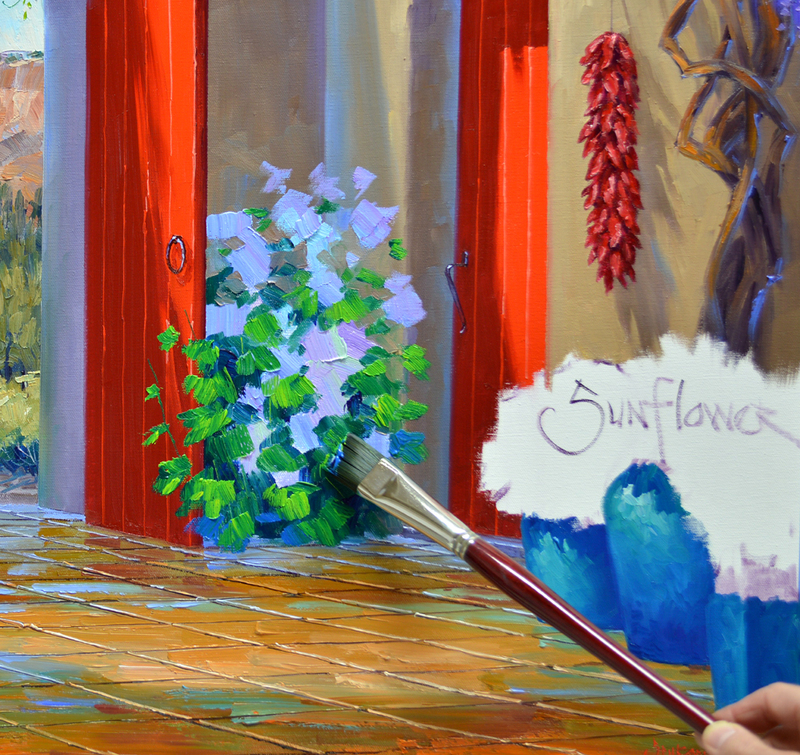 A touch of Cadmium Red Light is added for the brighter, warmer tiles in the foreground. The far edge of both shadow areas is made cooler so it will drop back. White is added to the shadow mixtures to make the sunlit portion of the floor. Then the lines separating the individual tiles are drawn with a fine liner brush dipped in a thin wash of MUD + Liquin. Edges of the tiles illuminated by the sun are highlighted. 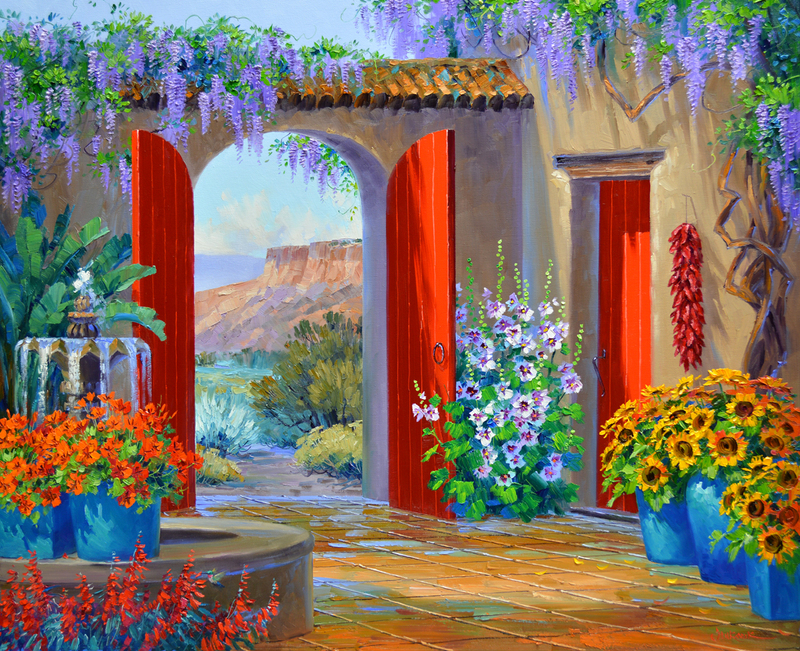 I decided Blue-Green containers would be a nice complement to the Red Doors and distant bluffs. 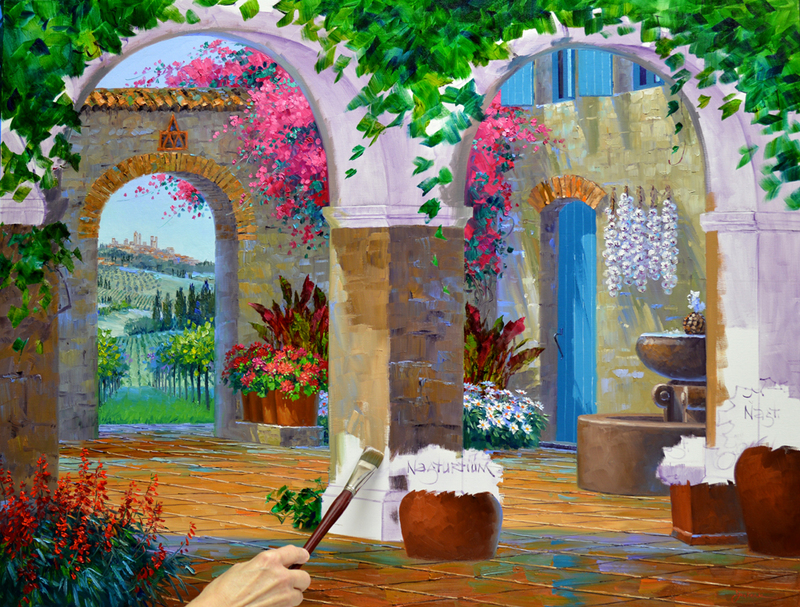 It’s fun to paint the water splashing down from the upper tier of the fountain. I let my brush skip and hop over the underlying paint to give the impression of moving water. 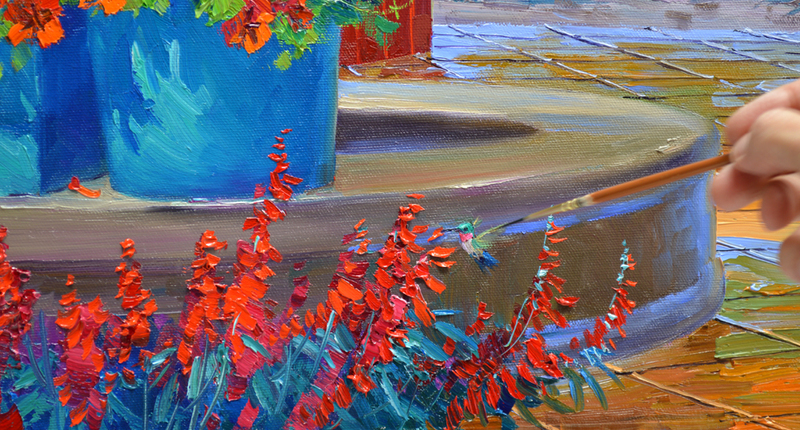 California Poppies add a Hot POP of color in the foreground, helping to bring more depth to the piece. We have a surprise visitor to our garden today, a Hummingbird. 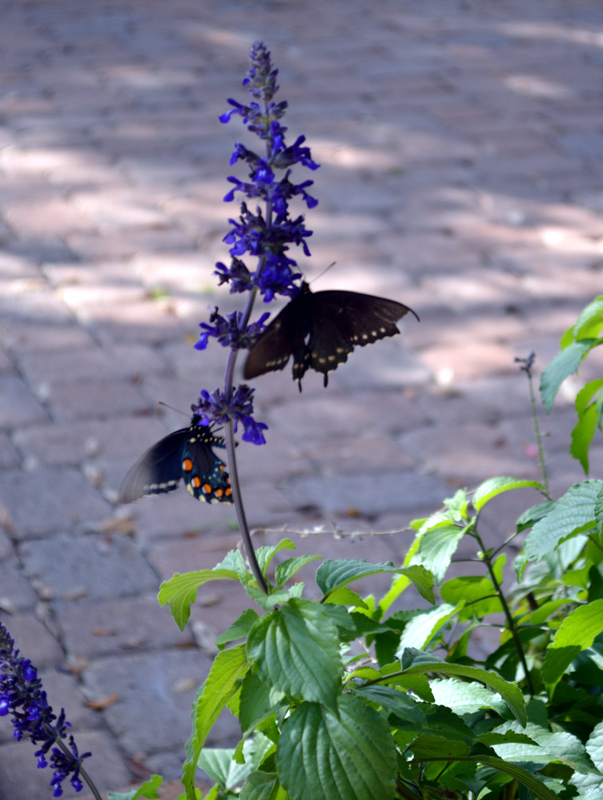 He is happily feeding on the Red Salvia I planted in front of the fountain. To see this or any of the other pictures enlarged just click on the image. White Hollyhocks are blocked in Flowers First, Leaves Last. 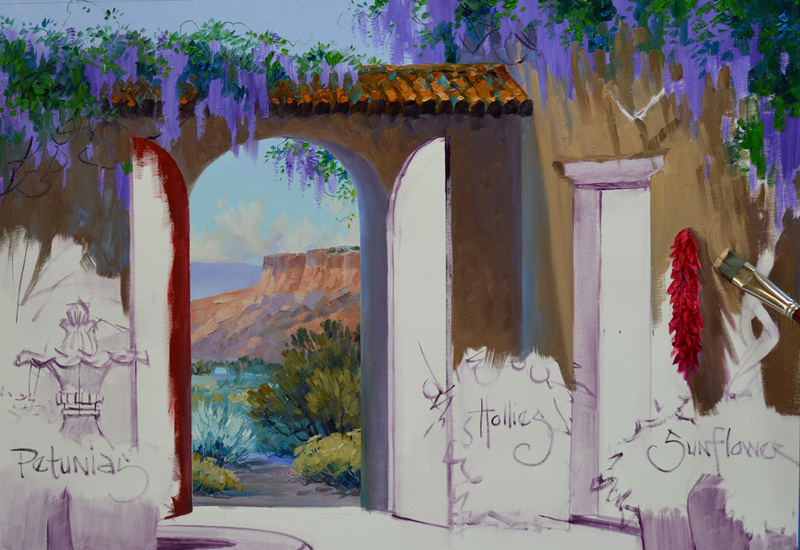 When I was designing the painting I thought their upright growth would provide a nice contrast to the round shapes of the California Poppies and Sunflowers. 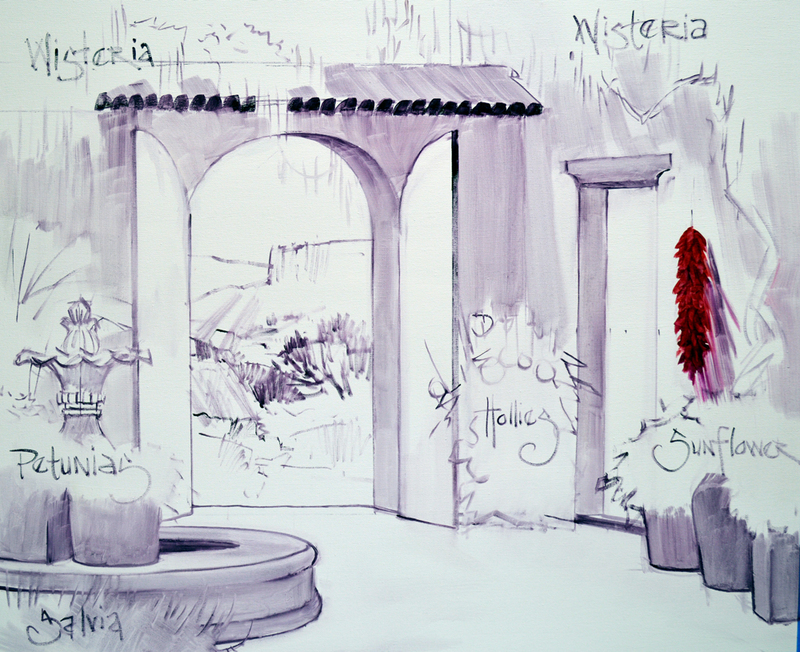 Dioxazine Purple is perfect for the Wisteria draping over the walls of the courtyard. It’s one of those special colors I use from time to time that’s not normally found on our regular Double Primary Palette. If you would like to know more about our color mixing system CLICK HERE. The colors for the terra-cotta tile roof and the adobe walls are shown above. #1. MUD (Ultramarine Blue + Alizarin Crimson) + Liquin. #2 – #6. MUD + Cadmium Orange. More MUD is used in the darker mixes, White is added for the lighter ones. #7. Ultramarine Blue + a little Cadmium Orange + White. #8. Pthalo Blue + Cadmium Orange + White. #9. Ultramarine Blue + Cadmium Orange + Cadmium Yellow Medium + White. #10 – #15. Cadmium Orange + Ultramarine Blue. MUD is added for the darker shades, White is used in the lighter ones. #16. Ultramarine Blue + White. The roof is complete, notice how mixes #8 and #9 are intermingled with the terra-cotta color to give the tiles an old age patina. The adobe wall on the right is made cooler, or bluer, in the far corner to make it recede. 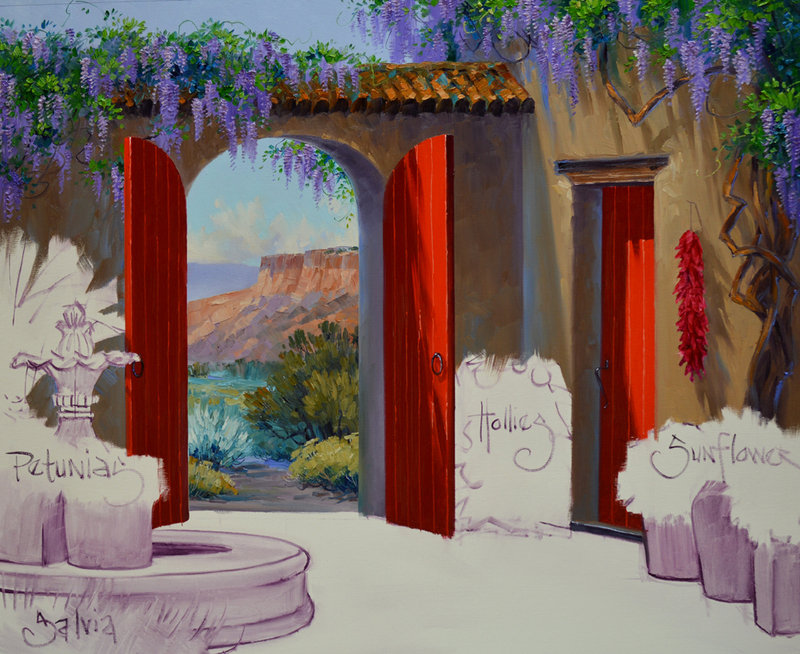 The shadow of the red doors is made of Cadmium Red Deep + Magenta, while the highlight is pure Cadmium Red Light. I’m wearing gloves because the paint thinner sometimes causes the skin on my hands to dry out and split. I don’t particularly care to use them because I don’t have the same sensitivity to the brush touching the canvas. But slathering my hands with lotion and wearing the gloves does help with the splitting. A girl just has to do what she has to do! 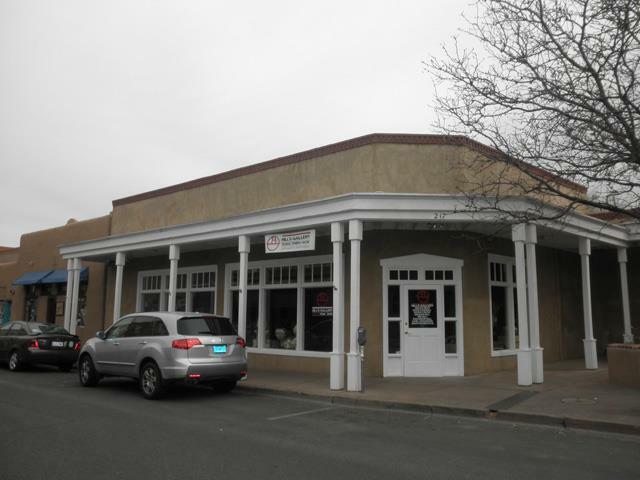 Here are a couple of shots of the new location of Santa Fe Art Collector gallery at 217 Galisteo Street! Isn’t it beautiful? The one on the left is before they got their sign hung up. 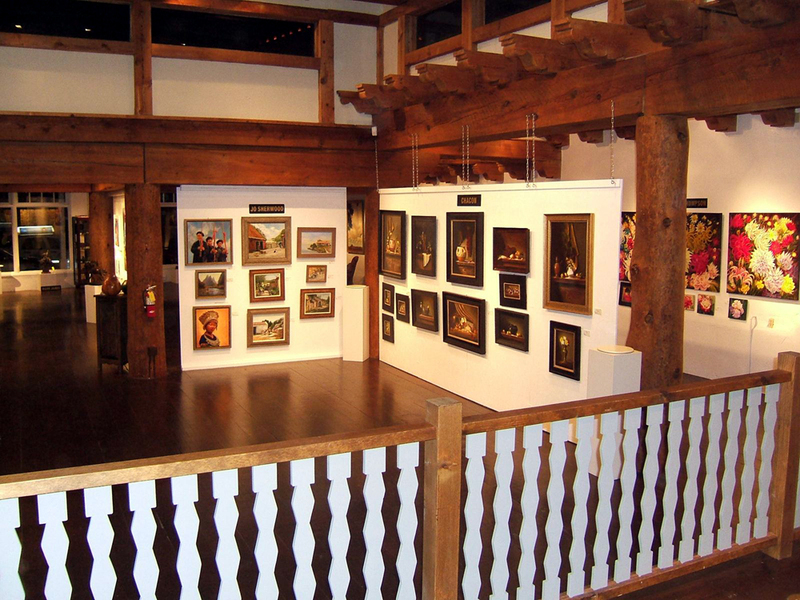 We are so excited, it’s going to be so fun to have our annual collector event there on August 30 and 31st. Please make plans to attend, we’d love to give you a hug in person. Phyllis and Darrell gave me a whole wall in the new space! They sold two pieces last week so I’ve got to get them something to fill the empty spots on “MY” wall. 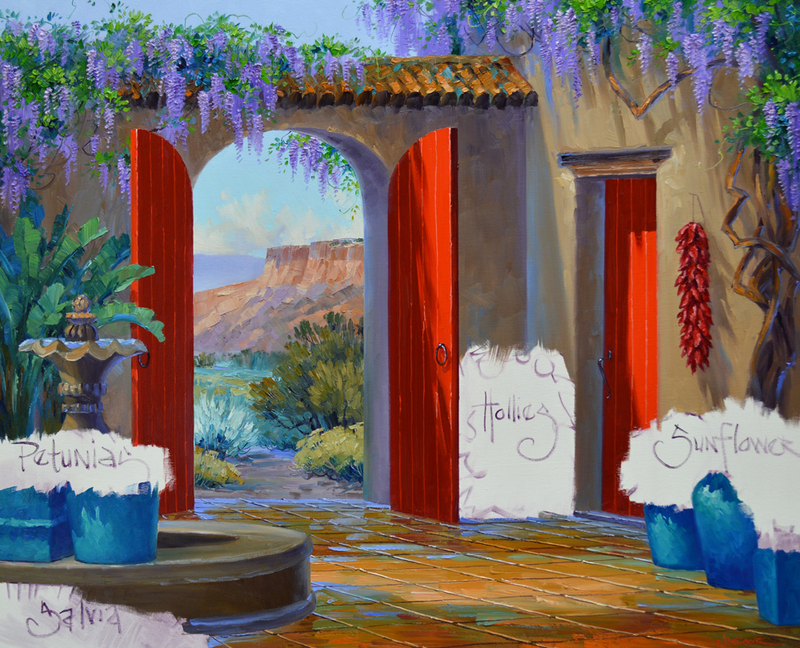 A serene courtyard always is popular. So let’s get to work. 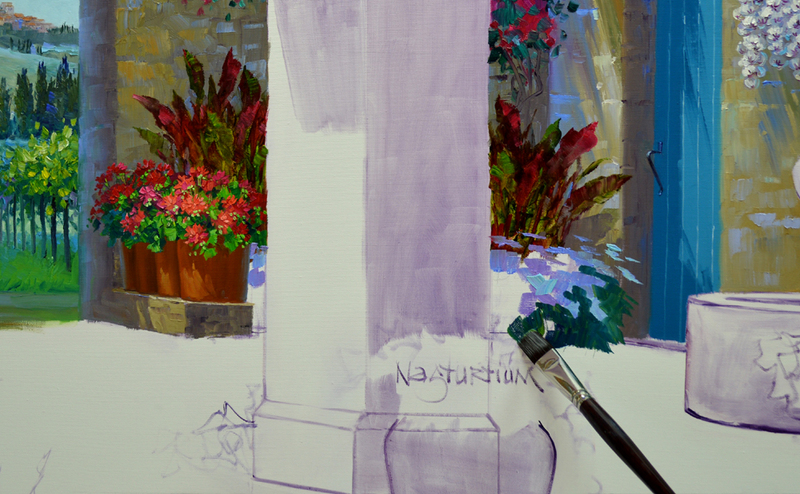 I sketch the basic architectural elements with a thin wash of MUD (Ultramarine Blue + Alizarin Crimson) + Liquin. The liquin thins the oil paint and makes it dry faster. 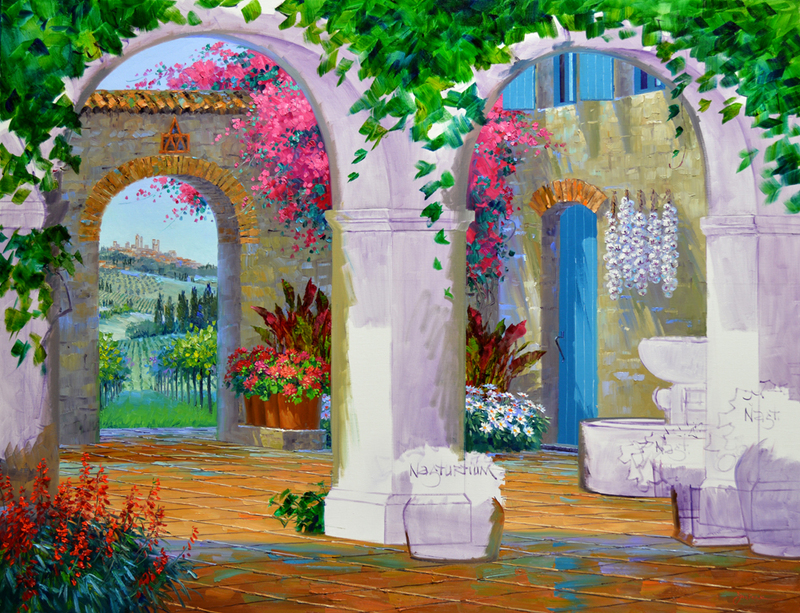 The scene though the open gates is drawn, shadows are washed in and the flowers labeled. The sketch is now complete. 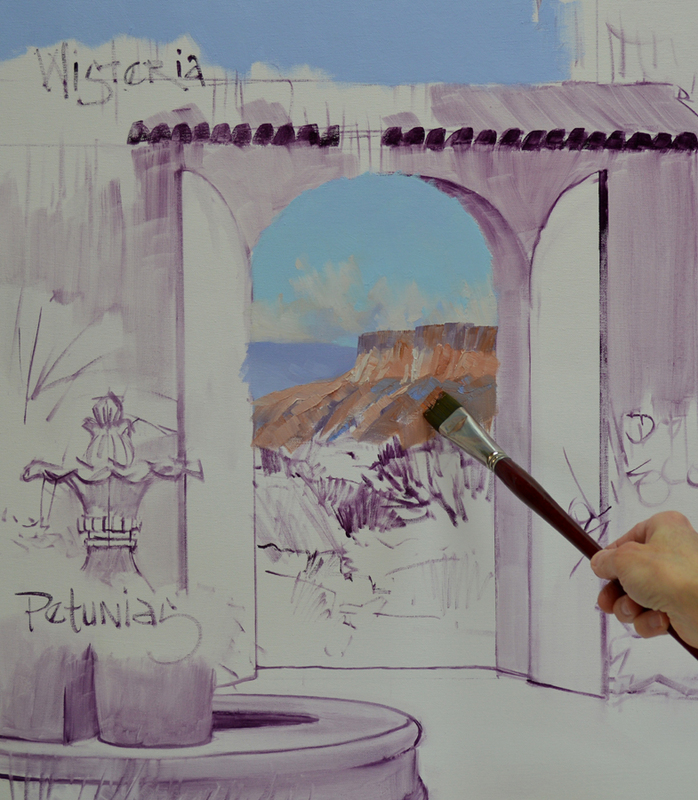 The sky is painted first, establishing the lighting for the piece. Working forward the most distant mountain is made cooler, or bluer, so it will recede. 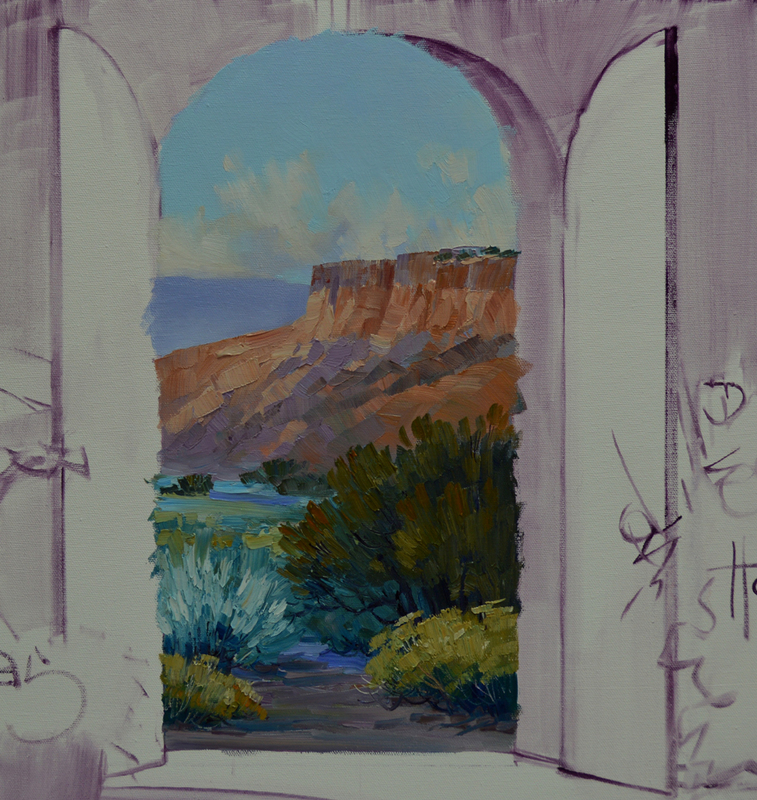 Then the foreground bluffs are blocked in with mixes of Ultramarine Blue + Cadmium Orange + White. MUD is added for the darker shades. 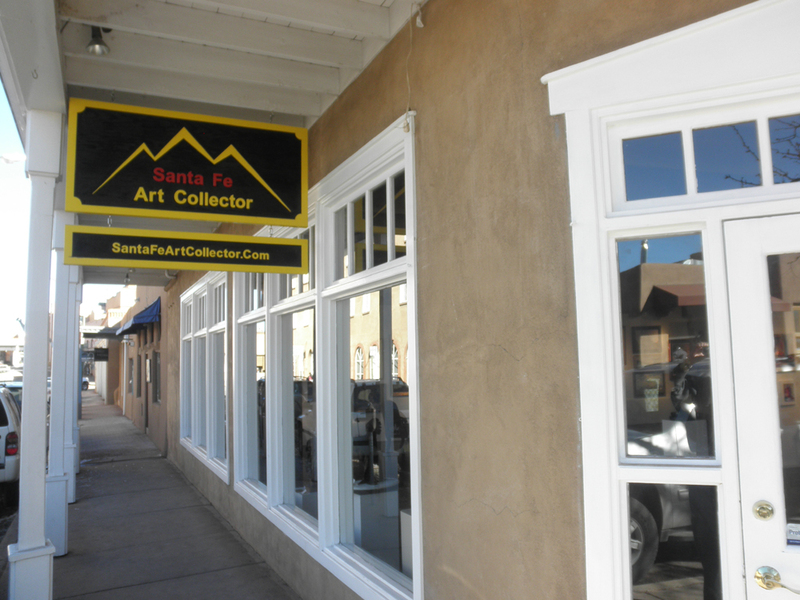 Our Santa Fe Gallery has moved to a new location at 217 Galisteo Street, just around the corner from their previous spot. The space is fabulous, I’ll be showing pictures soon on my blog. 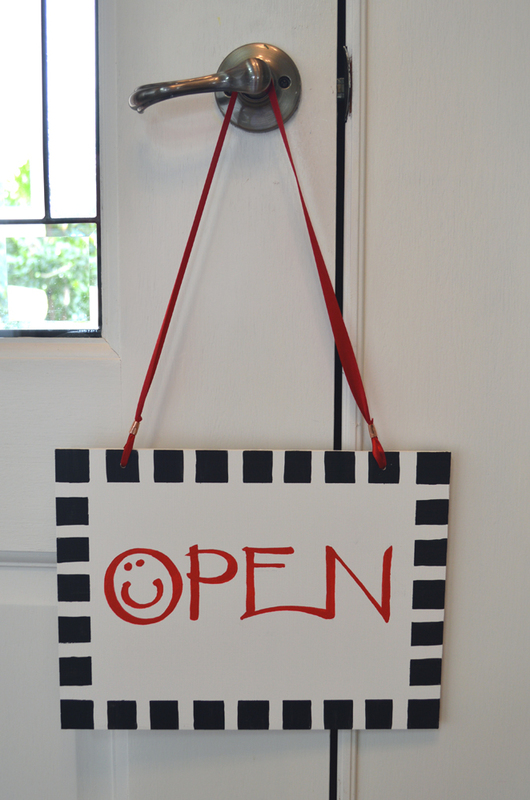 The owners asked me to make an OPEN/Closed sign, Phyllis just didn’t like the ordinary plastic one from the old location. 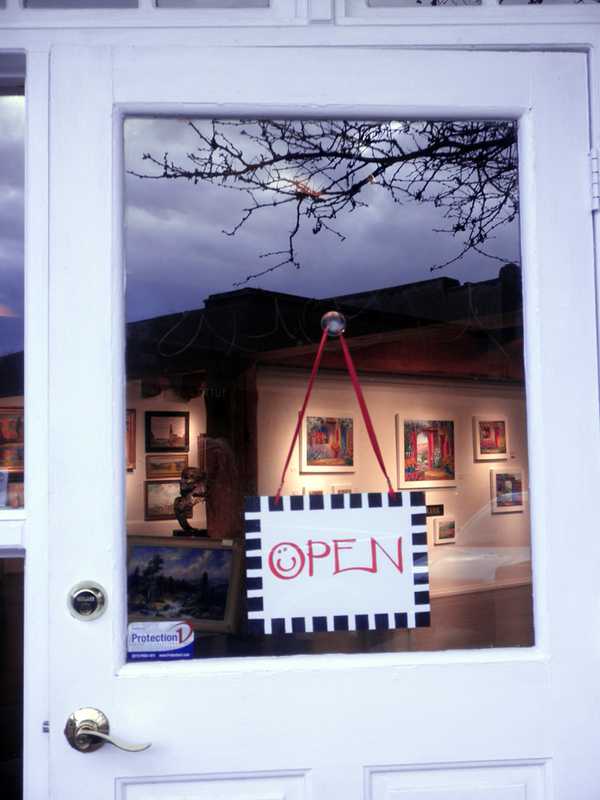 My intent is to make this sign lighthearted, letting clients know Santa Fe Art Collector is a happy and fun gallery. 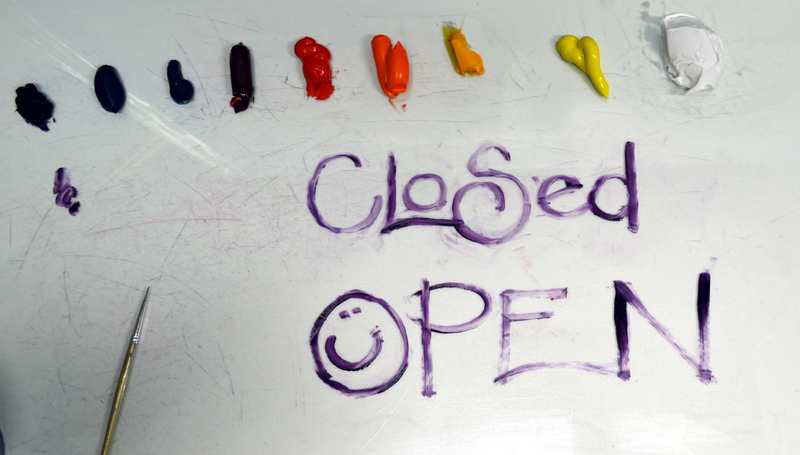 So I work out the lettering on my glass palette in a thin oil wash of MUD (Ultramarine Blue + Alizarin Crimson) + Liquin. A board is prepared with several thin coats of white acrylic on both sides. I want the surface to be a little bit slick, this makes it much easier to letter. 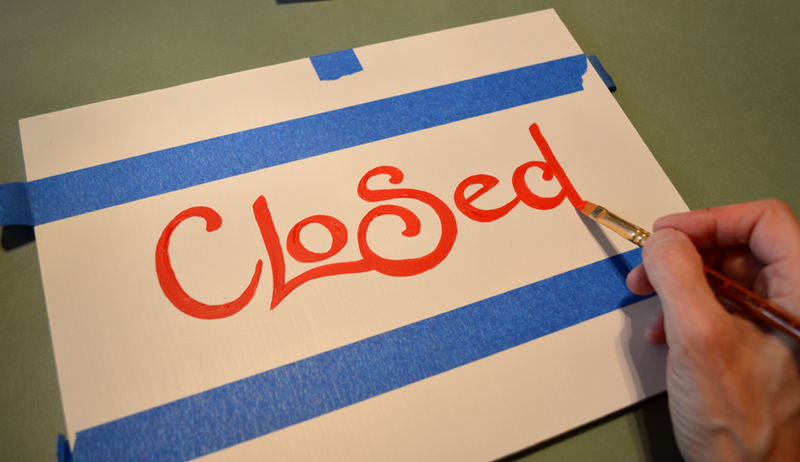 Blue Painter’s tape provides guidelines and the lettering is lightly penciled in. Just click on the picture to see it better. A small piece of tape is placed at the top so I will get both sides right side up. This is totally essential; I have to admit it’s my second attempt at doing the sign. I got the first one all lettered and was painting the outside border before I realized the back was upside down! OPPS! 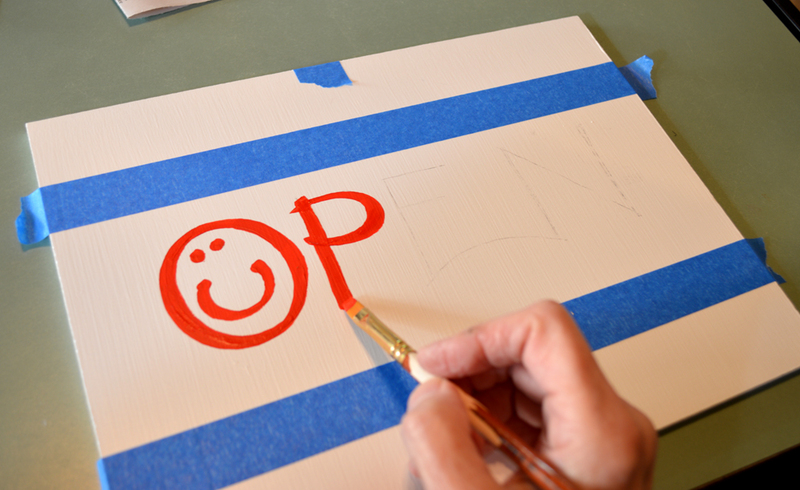 The lettering is done with Red Acrylic and a square water color brush. 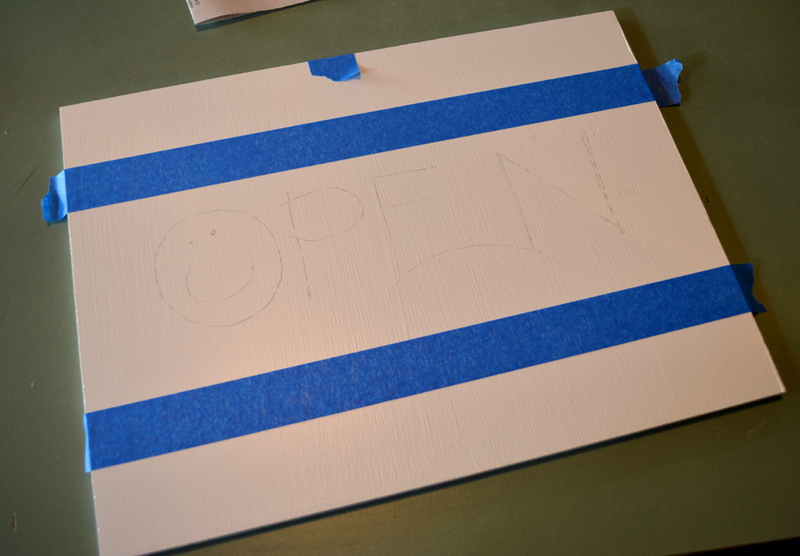 After the front is dry the board is turned over and the back is lettered, following the penciled in guidelines. I tape inside the edge leaving a one-inch margin around the outside of the board exposed. Notice how the end of the tape is folded under at the corners. This makes it much easier to pull up when the border is dry. 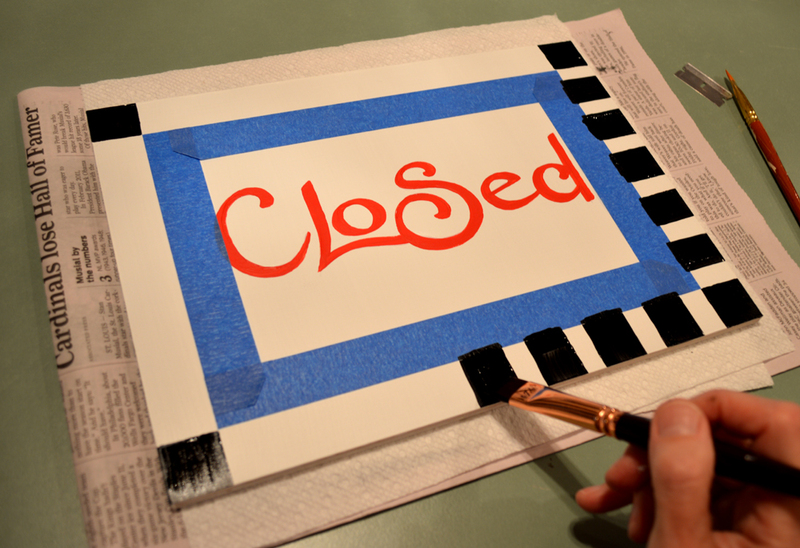 The tape is securely pressed down and a checked border is painted with black acrylic. The black paint is dry, so we can pull off the tape and Shazam! The sign is done. 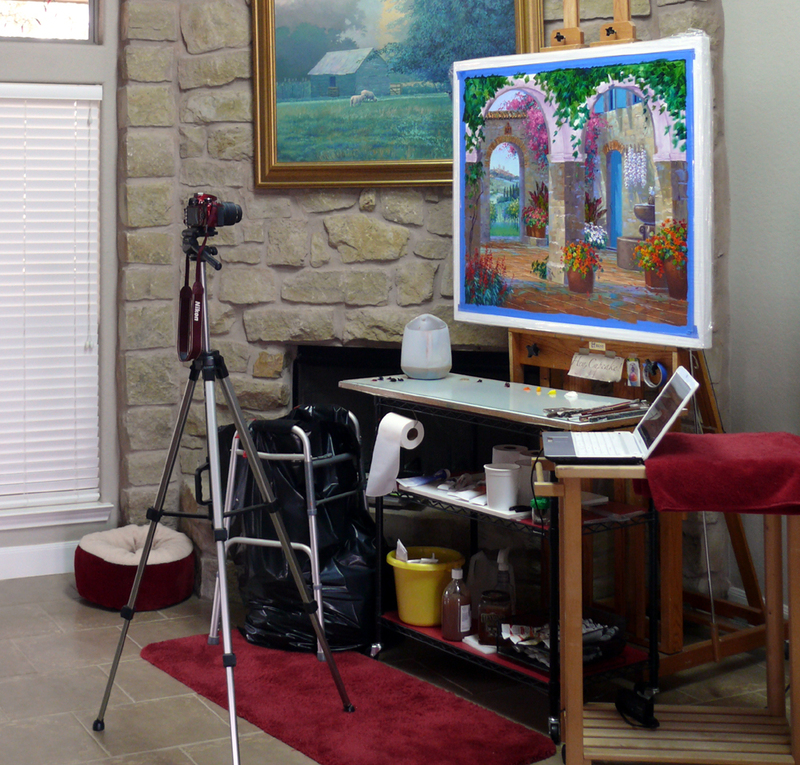 Many of you have asked about the photo setup we use to take high quality digital images of our paintings for reproduction and use on the internet. It’s really very simple. 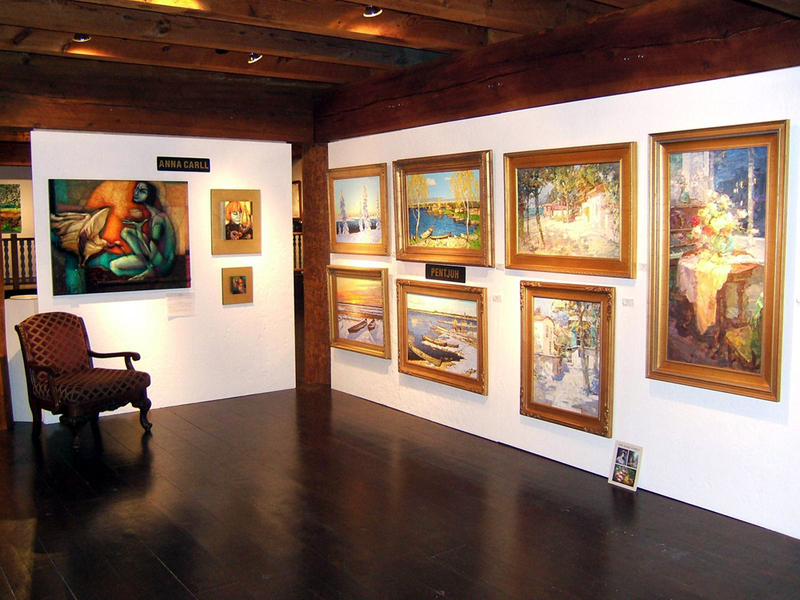 Daylight fluorescent lights are installed in the ceiling over our easels. These can be purchased at Home Depot or Lowes. For years, as we traveled from place to place, we just had double-tube shop light fixtures that we hung with chains from the ceiling over the easels. Our camera is a 24 megapixel NIKON D3200. Jack surprised me with the RED Nikon a couple of months ago and I love it! But don’t faint, you don’t have to get this elaborate. For years we used an 8 megapixel OLYMPUS and it worked perfectly. We’ve used those images from the OLYMPUS camera to make large giclees. I must warn you though, images taken with a cell phone camera are not good enough for reproduction! The camera is placed on a tripod and set on the timer function. The picture above shows the setup. This is also how I take the step-by-step pictures for the blog. The 10 second timer gives me plenty of time to get back to the canvas and be painting when the shutter releases. 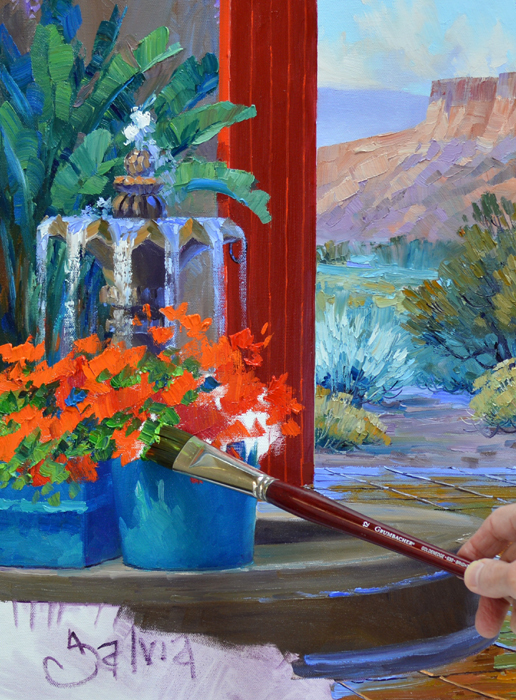 When taking the picture of your painting for reproduction, zoom in so the image fills the frame as shown above. This way you will get the largest possible file. Make sure your camera is set for the highest quality and largest file size. Set the timer, focus and take the shot! By using the timer there will be no jiggle like you can get when the shutter release button is pressed down. Here is the final image after a little color correction in Adobe Photoshop. The Nikon has its own program but I’m so familiar with Photoshop I just use that. There is another option for taking pictures of your art that we have also used successfully. 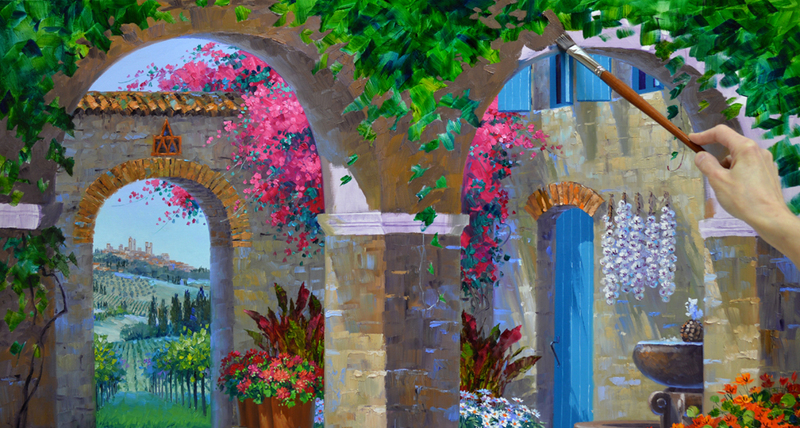 Take your painting outdoors into the shadow of a building. Lean it against the building and then, standing in that same shadow with your back to the bright light, photograph the art. 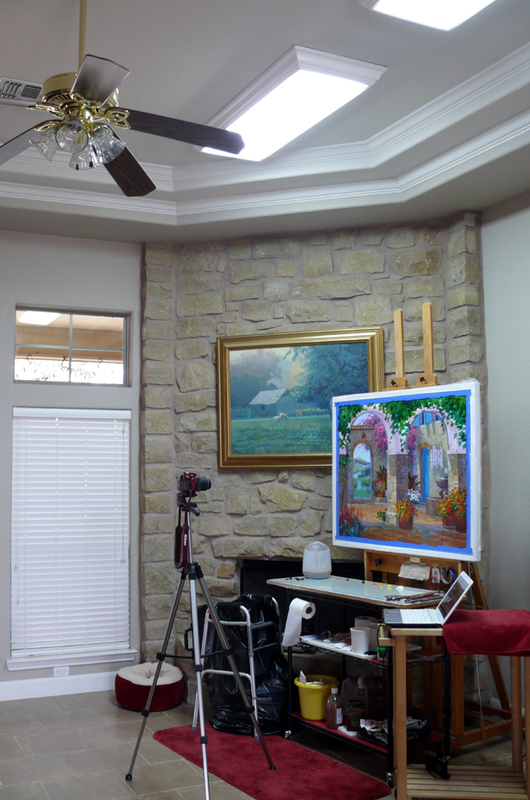 We use this method when I do a painting demo at the galleries and don’t have our studio setup available. The stone of the foreground arches is made warmer than that of the opposite side of the courtyard. I just add a bit of Cadmium Orange to the mixes from the other walls. The extra warmth makes these arches come forward. Nasturtiums are planted in the foreground containers. The flowers are blocked in first as shown in #1. In #2 the green of the leaves is worked around the blossom color. This way the flowers remain bright and crisp. 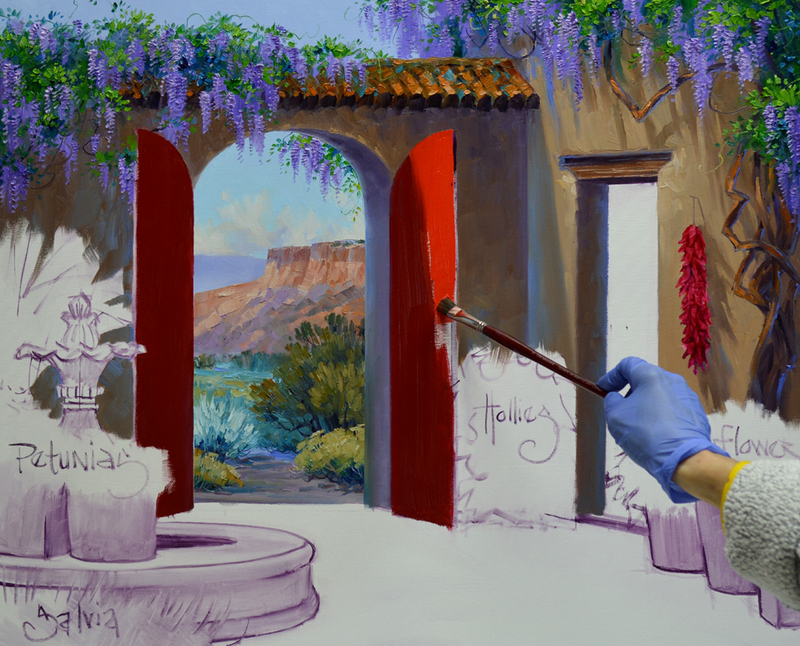 If the green was done first, my brush would pick up some of the foliage color when painting the flowers and they would get muddy. This is a simple sequence I follow most of the time: Flowers First, Leaves Last. 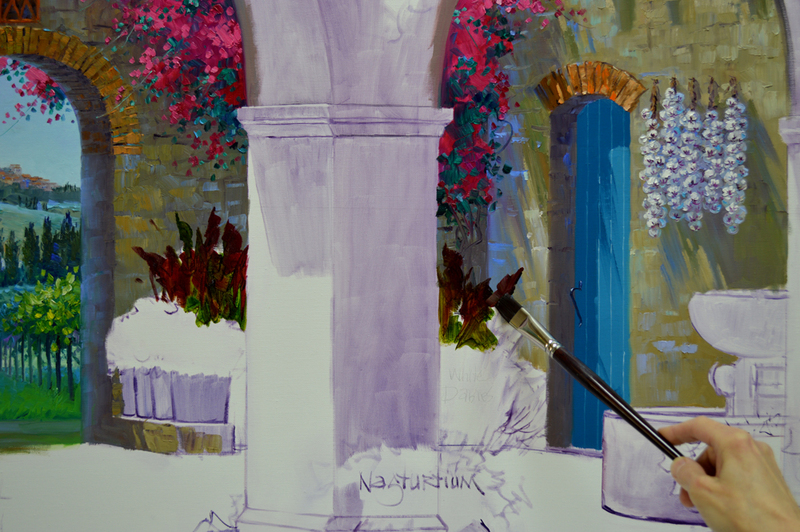 The washed in base coat of the vine over the arches is dry. The stone color is worked around the green, shaping the leaves. Remember, if you would like to see any of the pictures larger just click on the image. There are exceptions to the ‘Flowers First, Leaves Last’ sequence. 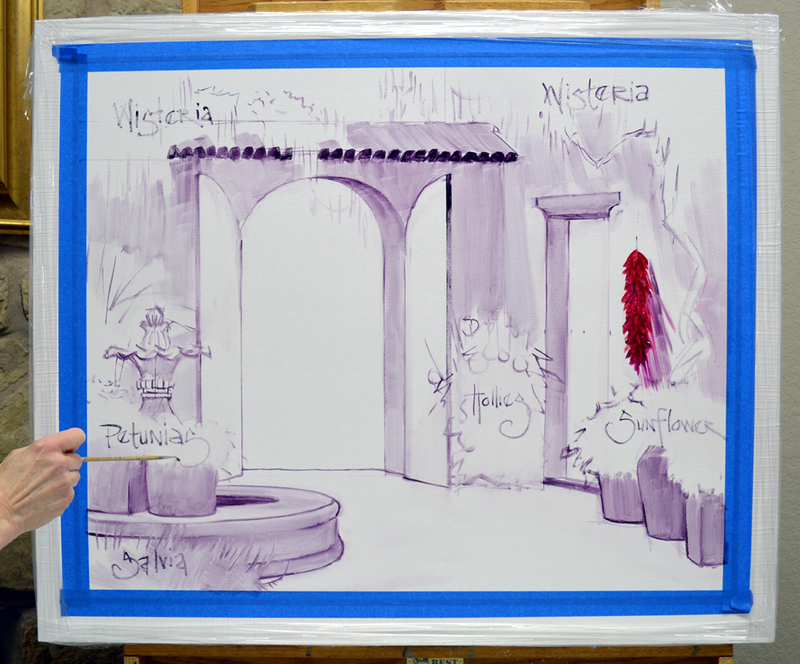 Since the underlying green is dry I can paint the purple Thunbergia flowers directly over the leaves. 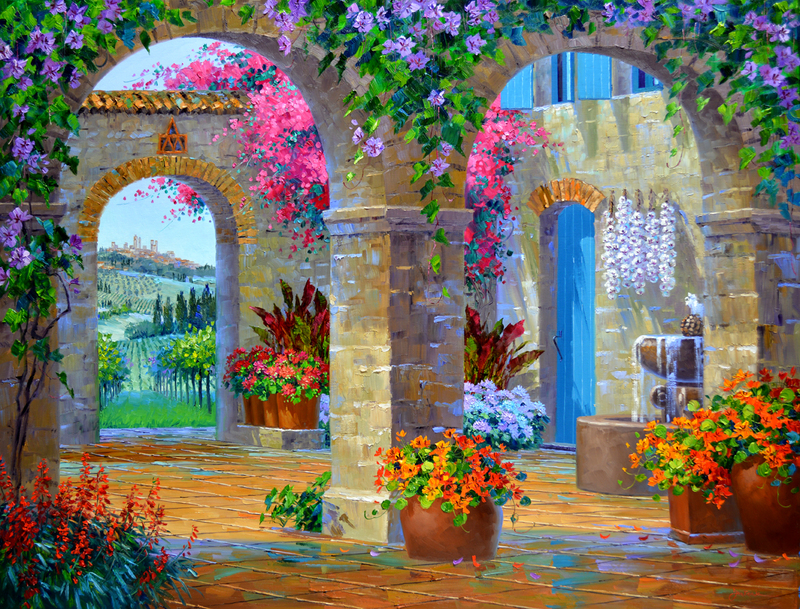 Since the landscape through the archway is primarily green, I want the flowers and foliage closest to the arch to be in the red-pink-orange family. Placing the complimentary colors, red and green, next to each other makes each appear more vibrant. Red leaf Canna Lilies are perfect here, they are washed in with Alizarin Crimson + Liquin and Sap Green + Liquin. Red and salmon colored Geraniums are planted in the terra-cotta containers. White Daisies nestle at the base of the Canna Lilies. The soft coolness of the blue and purple shadows makes them drop back. White petals highlighted by the sun are added along with the warm orange and yellow centers of the Daises. Now let’s move to the top of the piece. I was recently asked if I use any greens directly from the tube. For the most part I mix all of the greens used in my paintings. However, there are some instances where Sap Green and Viridian Green Hue come in handy. This is one of those times. These colors make a wonderful under wash when mixed with Liquin, as in the Sap Green used in the Canna Lilies by the distance arch. 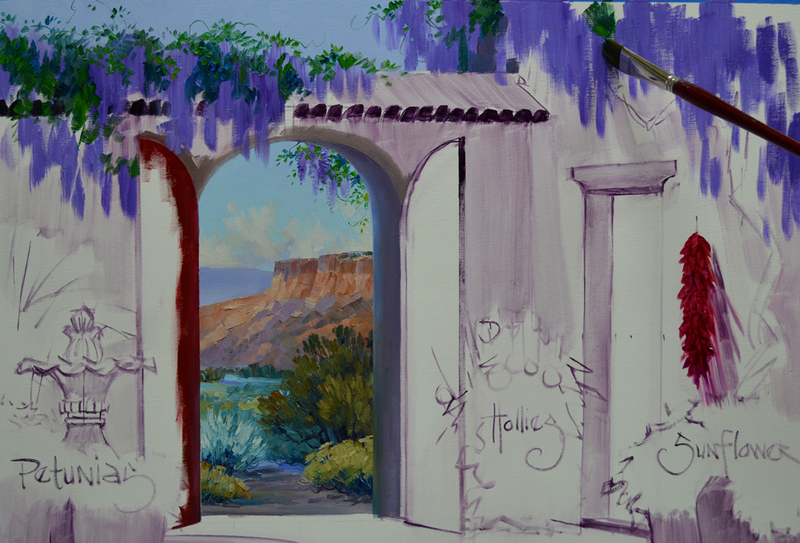 Washes of the two greens are jumbled together to make the base coat of the vines hanging over the foreground arches. The light and shadow patterns on the floor are painted with a large Bright brush. Notice how the far edge of the distant floor under the arch and also the back of the foreground shadow are made cooler or bluer. This is so they will recede. Perspective lines delineating the terra-cotta tiles are drawn in freehand with a fine liner brush. I can’t use the mahl stick here, it would limit the movement of my arm and the lines wouldn’t be smooth. To see this more clearly just click on the picture to enlarge it. Thought you might enjoy seeing some of Jack’s work. I don’t know if you know that he taught me to paint! CLICK HERE to visit his website.